As a guest, what do you expect from a hotel of the future? 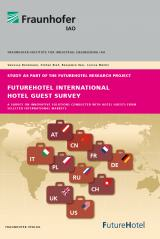 The aim of this »FutureHotel International Hotel Guest Survey« was to find out what guests expect from the hotels of tomorrow, what range of services will be expected in the future. Technological progress and people's growing mobility is changing the travel industry fundamentally. Travellers already expect additional services that make their travel planning and their stay easier and more flexible to arrange. The study identifies which innovations travellers want when it comes to booking their hotel stays, what guests in hotels value particularly highly or criticise and what kind of service will be expected in the future. On this basis, the current need for change and the requirements of the future can be deduced. The results of the academic study are a contribution to the development of innovative solutions. In this way, what hoteliers, product manufacturers and service providers in the hotel sector have to offer can be adapted in future to the wishes of specific types of guests and target groups, and hotels can be optimised to suit those guest.